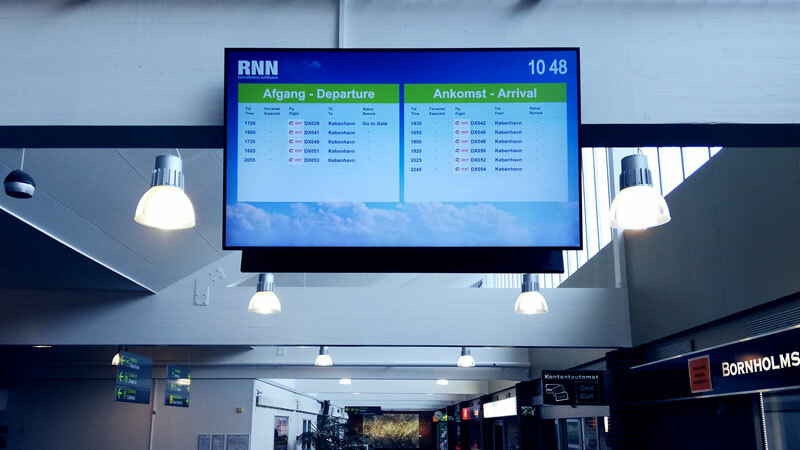 ViasFIDS is a Flight Information Display System for small and medium sized airports. 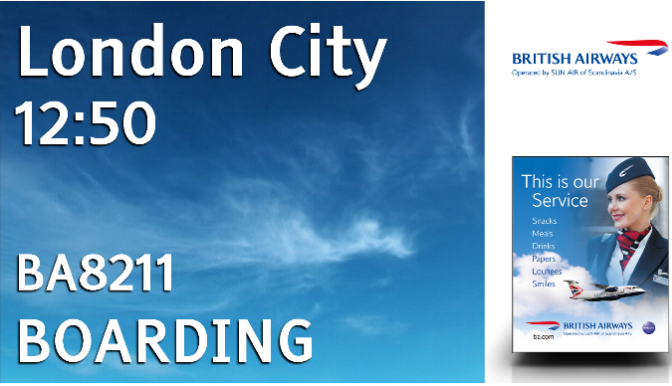 It is available as an installed and as a cloud solution and it is multi airport solution. The viasFIDS package contains many use full features like a flight generator, a stand allocation package, gate assignment, check-in handling, baggage handling features etc. All these features are configurable through administration programs. The package has the possibility to handle automatic flight status messages from SITA or other message suppliers. The airport may be operated automatically without operator interventions. The airport may at any time, be operated manually through the ViasFlight program. If you combine viasFIDS with a standard economy system, it is possible to operate the complete airport without investing in a separate AODB system. If you already have an AODB system, the viasFIDS system will easily integrate into it. The display engine is based on the Chrome browser. Therefore, the graphic possibilities are virtually endless. The flight information pages can easily be combined with advertisement pages. The pages may be created by the customer in HTML5. Push technology is obtained by using web-sockets for accomplishing real-time data flow. Which gives response times < 2 seconds. 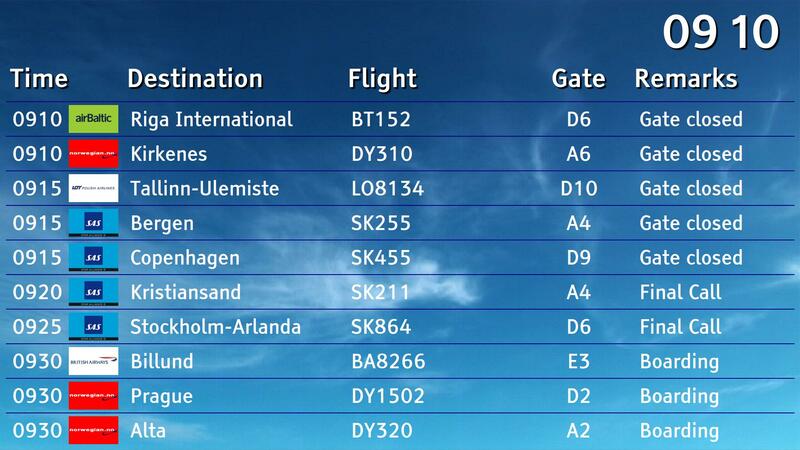 The Flight browser displays the flights in order by STD or STA. Arrival and Departure flights is distinguished by background colors. For visibility the cancelled or replaced flights are also distinguished by background colors. 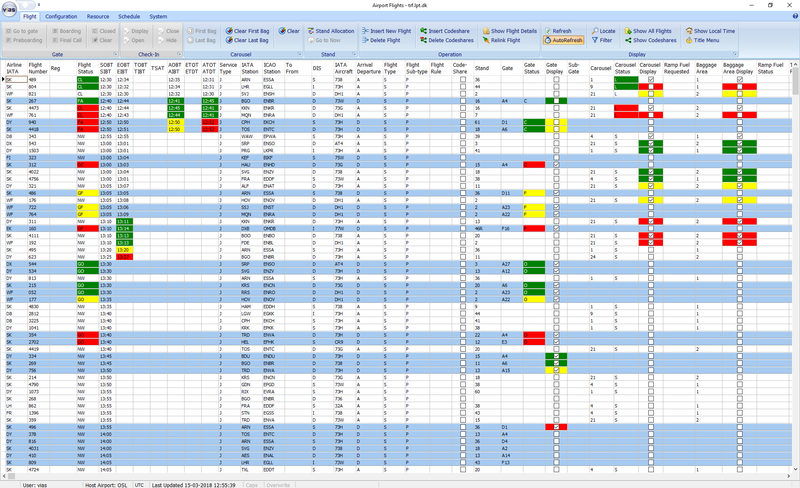 Changes to data are highlighted by timestamp colors. The timestamp colors are divided into three groups, 0-3, 3-6 and 6-15 minutes since last change. The allocation of resources like Stand, Gate and Belt may be done automatically, in advance on a weekly base from a predefined schedule. 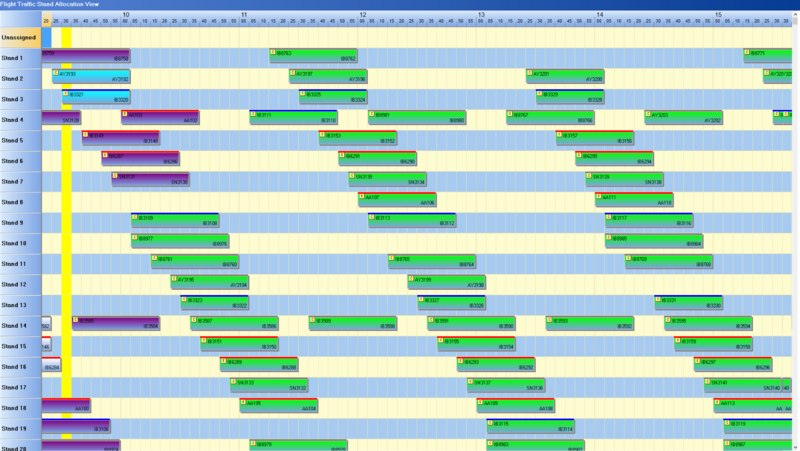 The automatically generated resource schedules may then be manually changed afterwards. In the check-in application the information is planned independently from the individual flights, but they may be linked, in order for let flight information be shown at the checkin counters. Integration with all important airport systems such as AIMS, slot and allocation systems. 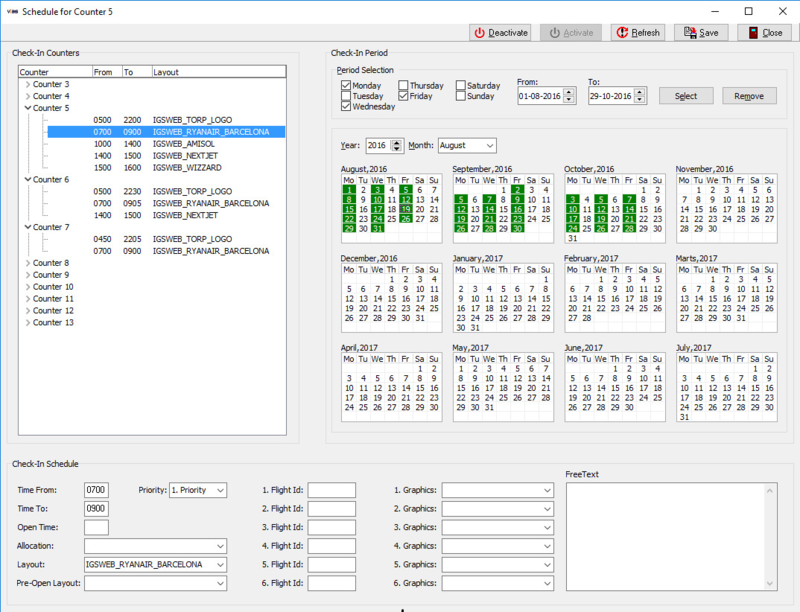 A centralized monitoring system A system that can interface to type-b messages providers like SITA or ARINC or even receive type b-messages on POP3 e-mails. A pricing model that reflects the size of your airport where you have access to the full packaged no matter how big or small your airport is. A system capable of informing your different staff groups, where you are in control of the filters used for each group. A state of the art user administration where you define user profiles and applies them to user groups. During installation we can deliver onsite skills for tuning and configuration of the solution. Controlled tests of all interface, layouts and devices are carried out based on an of both parties agreed test protocol. We deliver consulting services in form of plain counseling or IT infrastructure or development jobs. Customers may be part of a scheduled product upgrade program. The updates contain new features, bug fixing etc. Event driven solution with a small server footprint. Based on the industry standard and reliable Oracle database and programmed in JAVA and C, depending on the task to be solved. Exchange of data with other systems are done over publish subscribe webservices. The product can be customized and adapted to fulfil specific airport requirements. LPT specializes in Traffic Information Systems i.e. AODB, FIDS, PIS and PAS. © 2018 LPT Industrial Software. All rights reserved.